To increase understanding of human bacterial and parasitic pathogens in bats, we investigated the prevalence of Babesia spp., Rickettsia spp., Anaplasma spp. and Coxiella burnetii in bats from China. Bats were captured from Mengyin County, Shandong Province of China using nets. DNA was extracted from the blood and spleen of bats for molecular detection of Babesia spp., Rickettsia spp., Anaplasma spp. and Coxiella burnetii with specific primers for each species. A total of 146 spleen samples and 107 blood samples of insectivorous bats, which belonged to 6 species within two families, were collected from Mengyin County, Shandong Province of China. We found that two Eptesicus serotinus (2/15, 13.3%) were positive for Babesia vesperuginis. We were unable to detect genomic sequences for Rickettsia spp., Anaplasma spp. and Coxiella burnetii. To our knowledge, our study showed for the first time the presence of Babesia vesperuginis in Eptesicus serotinus collected from China, suggesting that Babesia vesperuginis has a broad host species and geographical distribution. Bats have been studied in recent years due to their association with several serious emerging viruses, such as SARS-Coronavirus, Hendra virus, Nipha virus, Ebola virus and Marburg virus . Most studies have focused on emerging viruses; however, bacterial and parasitic agents in bats have been largely neglected. 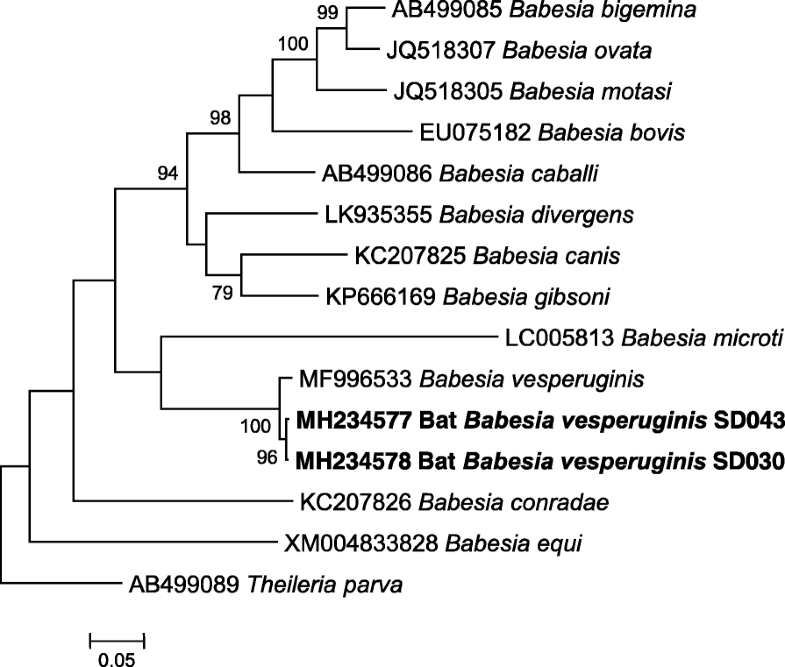 We previously showed that bats from northern China carried several novel Bartonella spp. as well as a diversity of pathogenic Leptospira spp. . To have a better understanding of bacterial and parasitic pathogens in bats, we expanded our study to several tick-borne bacterial and parasitic pathogens, including Babesia spp., Rickettsia spp., Anaplasma spp. and Coxiella burnetii. Babesia spp. are tick-transmitted protozoan hemoparasites associated with a wide range of vertebrate hosts worldwide . So far, Babesia spp. detected in bats have been almost exclusively Babesia vesperuginis [5–9], with the exception of a study reporting Babesia canis, the causative agent of canine babesiosis, in the feces of bats from Hungary . In addition, a recent study reported the detection of B. vesperuginis, Babesia crassa and B. canis in ixodid ticks on bats , which indicated that bats could harbor a greater diversity of Babesia species and hard ticks could also play a role in Babesia transmission among bats. The role of bats in the ecology of Babesia spp. as well as the vectors involved in transmission of Babesia spp. among bats deserves further investigation. Rickettsia spp. are intracellular bacteria that are responsible for life-threatening spotted and typhus fevers in humans . So far, Rickettsia spp. infections in bats were limited to several serological and molecular surveys in America, Africa and Europe. Antibodies against several spotted fever group (SFG) Rickettsia spp. were reported in bats from Brazil and USA [13, 14]. DNA of Rickettsia spp. was also detected in the blood samples of bats from Swaziland, South Africa and Saint Kitts Island [15, 16]. A recent study conducted in Europe showed that Rickettsia spp. DNA was detected in bat feces . Moreover, bat ectoparasites, including soft ticks (Argasidae), hard ticks (Ixodidae) and flies (Nycteribiidae), were found to carry a diversity of Rickettsia spp. that were identical to those found in bats, indicating the vector-borne transmission of Rickettsia spp. [18–23]. So far, there is a lack of knowledge on Rickettsia spp. in bats in Asia. Anaplasma spp. belong to the order Rickettsiales, causing tick-borne anaplasmosis in animals and humans . So far, there is no report of Anaplasma spp. in bats. Coxiella burnetii is an obligate intracellular gram-negative bacterium, and is the agent of Q fever . So far, there are no reports of C. burnetii in bats. However, its existence in ticks from bats has been reported in Algeria . Therefore, the aim of the study was to investigate the prevalence of Babesia spp., Rickettsia spp., Anaplasma spp. and C. burnetii in bats from China. Bats were captured with nets from Mengyin County, Shandong Province of China (117°45' to 118°15'N,35°27' to 36°02'S) as part of an ongoing program of detecting novel microorganisms (viruses, bacteria and parasites) in bats. Identification of bat species was performed by DNA sequencing the PCR amplified cytochrome b (cytb) gene as described previously . Details on the collection of bat specimens are as described previously . Briefly, bats were anesthetized for collecting blood samples, and were then killed with overdosed anesthetic to collect organs. Bat blood DNA extraction was performed with the Qiagen DNA Kit (Qiagen, Hilden, Germany) and the spleen was extracted with the AllPrep DNA/RNA Mini Kit (Qiagen), according to the manufacturer’s instructions. Blood DNA samples were screened for Babesia spp., Rickettsia spp. and Anaplasma spp. Spleen DNA samples were screened for C. burnetii. Primers used in this study are shown in Table 1. For Babeisa spp., an initial screening PCR targeting 18S rDNA was conducted in a 50 μl mixture containing 25 μl DreamTaq Green PCR Master Mix (2×) (Thermo Fisher Scientific, Waltham, MA, USA), 0.8 μl 25 μmol/l of each forward and reverse primer (Sangon Biotech, Shanghai, China), 16.4 μl nuclease-free water, and 7 μl blood DNA of each sample. Nuclease-free water was used as negative controls. PCR was performed under the following conditions: 1 denaturing cycle at 95 °C for 5 min followed by 35 cycles at 95 °C for 30 s, 55°C for 30 s, and 72 °C for 1 min and an additional final cycle at 72 °C for 10 min. For 18S rDNA positive samples, an additional nested PCR targeting cox1was performed. The first round PCR was conducted in a 25 μl mixture containing 0.125 μl 5 U/μl TakaRa Ex Taq (TaKaRa, Shiga, Japan), 2.5 μl 10×ExTaqbuffer (Mg2+ free), 2 μl 25 mM MgCl2, 2 μl dNTP mixture (2.5 mM for each), 0.4 μl 25 μmol/l of each forward and reverse primer, 12.6μl nuclease-free water and 5 μl blood DNA of each sample. The second round PCR was the same as described above for 18S rDNA except that 3 μl of first round PCR product was used as a template. The PCR condition was the same as described for 18S rDNA, but the annealing temperature for the first and second rounds of PCR were 45 °C and 49 °C, respectively. For Anaplasma spp. and C. burnetii, a nested PCR was conducted as described for cox1 of Babesia spp. Blood DNA and spleen DNA were used for the detection of Anaplasma spp. and C. burnetii, respectively. The PCR conditions were the same as described for 18S rDNA of Babesia spp. PCR products were analyzed by 1.2% agarose gel electrophoresis and detected using ethidium bromide under UV light. PCR products with expected sizes were excised from gels and extracted using a Gel Extraction Kit (Promega, Madison, WI, USA), which were then cloned into the pMD19-T vector (TaKaRa) for sequencing. Quantitative real-time PCR (qPCR) was used for the detection of Rickettsia spp. The reaction was conducted in a 50 μl mixture containing 25 μl FastStart Universal SYBR Green Master (ROX), 0.8 μl 25 μmol/l of each forward and reverse primer, 16.4 μl nuclease-free water, and 7 μl blood DNA of each sample. The tests were performed using a Light Cycler 480 II (Roche, Mannheim, Germany) with the following conditions: an initial denaturation at 95 °C for 10 min, followed by 40 cycles at 95 °C for 10 s and at 58 °C for 30 s. Nuclease-free water was used as negative controls in each run. Results were considered positive if the cycle threshold (Ct) value was lower than 36. Chromatograms were checked with Chromas 2.5.1 (Technelysium, Tewantin, QLD, Australia) to exclude double peaks, and sequences were analyzed with the BLAST programme (http://blast.ncbi.nlm.nih.gov/Blast.cgi). After alignment by ClustalW with MEGA 7.0 , phylogenetic trees were constructed using the Maximum Likelihood method with the Tamura-Nei model by using MEGA7.0, and bootstrap values were calculated with 1000 replicates. A total of 146 bats belonging to 6 species within two families were sampled. Bats of the family Rhinolophidae included 4 Rhinolophus ferrumequinum and 14 Rhinolophus pusillus captured from a karst cave; bats of the family of Vespertilionidae included 26 Eptesicus serotinus from two farmers’ houses, 34 Myotis fimbriatus and 10 Myotis ricketti from a city sewer and 58 Myotis pequinius from a cave (Table 2). Finally, 146 spleen DNA samples were screened for C. burnetii, and 107 blood DNA samples were screened for Babesia spp., Rickettsia spp. and Anaplasma spp. In this study, we found that 2 out of 15 blood samples of E. serotinus (2/15, 13.3%) were positive for Babesia spp., while blood samples of the other 5 bat species (Rh. ferrumequinum, Rh. pusillus, My. fimbriatus, My. ricketti and My. pequiniu) were all negative. BLAST analysis of the 517 bp 18S rDNA sequences showed that the two Babesia spp. 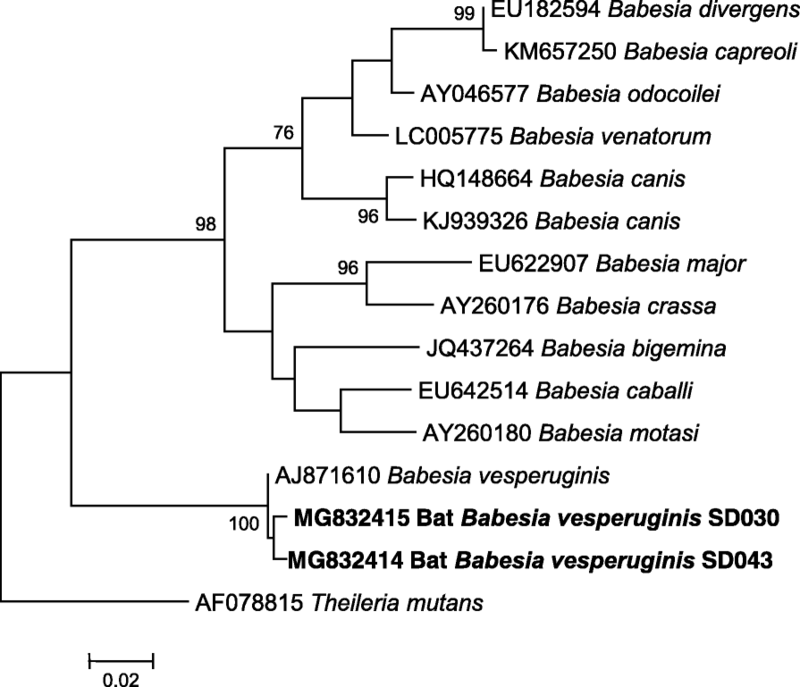 detected in E. serotinus in this study (designated as bat Babesia vesperuginis SD030 and bat Babesia vesperuginis SD043), which differed by 4 nucleotides, shared 99.4% similarity with B. vesperuginis (GenBank: AJ871610). BLAST analysis of the 924 bp cox1 sequences showed that the bat Babesia vesperuginis SD030 and bat Babesia vesperuginis SD043 differed by 3 nucleotides, and shared 98.2% and 98.1% similarity with B. vesperuginis (GenBank: MF996533), respectively. Phylogenetic analysis of 18S rDNA and cox1genes also showed that Babeisa spp. detected in bats in this study clustered together with B. vesperuginis (Figs. 1 and 2). The 18S rDNA and cox1 sequences of B.vesperuginis of this study were deposited in the GenBank with accession numbers: MG832414-MG832415 and MH234577-MH234578. We were unable to detect genomic sequences for Rickettsia spp., Anaplasma spp. and C. burnetii. Babesia vesperuginis in bats was first described in bats from Italy, and later also found in bats from other parts of Europe (UK, Austria, Czech Republic, Romania) and South America (Colombia) [5, 7–9]. So far, B. vesperuginis has been detected in Nyctalus noctula and Pipistrellus sp. from Italy; My. mystacinus and Pipistrellus sp. from the UK; Mormoops megalophylla from Colombia; My. alcathoe, My. bechsteinii, My. myotis and Vespertilio murinus from Romania; Ny. noctula, Pi. nathusii and Pi. pipistrellus from the Czech Republic; Pi. pipistrellus and Ve. murinus from Austria; and Pi. pipistrellus from China [5–9]. The prevalence of B. vesperuginis in Pipistrellus spp. in Europe has been reported as 8.45% (6/71), 9.22% (19/206), 16.7% (6/36) and 10% (5/48) [6, 7, 9, 29]. The prevalence of B. vesperuginis in Mo. megalophylla in South America and in N. noctula in Europe was reported to be 1.19% (2/168) and 1.63% (4/246), respectively [5, 7]. However, the prevalence of B. vesperuginis in other bat species might be biased due to the limited sample size [7, 8]. In this study, the prevalence of B. vesperuginis in E. serotinus from China was 13.3% (2/15), which might also be biased by the limited sample size. To our knowledge, this is the first report of B. vesperuginis in E. serotinus, suggesting that B. vesperuginis has a broad host species and geographical distribution. Natural and experimental infection showed that B.vesperuginis was pathogenic to bats, which could result in symptoms such as lowered blood haemoglobin, raised white blood cell counts and enlarged spleen in bats . Soft ticks (Argas vespertilionis) were suspected to play a role in the transmission of B. vesperuginis among bats . Although no ticks were found on bats in this study, a recent study reported that soft ticks (Argas vespertilionis) collected from B. vesperuginis-positive bats (Pi. pipistrellus) were also positive for B. vesperuginis in northwestern China , indicating that soft ticks might be the vector for B. vesperuginis transmission among bats. We detected B. vesperuginis in E. serotinus collected from China, suggesting that B. vesperuginis has a broad host species and geographical distribution. Since B. vesperuginis is pathogenic to bats, the finding of this species in China has some implications for the conservation of bats in China. Hui-Ju Han and Jian-Wei Liu contributed equally to this work. We are grateful to Mengyin County Center for Disease Control and Prevention for their assistance in bat collection. This study was supported by a grant from National Natural Science Funds of China (No. 31570167). The B. vesperuginis sequences of this study are available in the GenBank under the accession numbers MG832414-MG832415 and MH234577-MH234578. HJH designed the study. HJH, JWL, HLW, XRQ, MZ, LJW, CMZ and YLZ participated in bat sampling and performed the experiments. HJH and RQ helped in data analysis. HJH, XJY and HY wrote the manuscript. All authors read and approved the final manuscript. The collection of bats for microbiological studies was approved by the Ethics Committee of Prevention Medicine of Shandong University (No.20150501). Hornok S, Szőke K, Estók P, Krawczyk A, Haarsma AJ, Kováts D, et al. Assessing bat droppings and predatory bird pellets for vector-borne bacteria: molecular evidence of bat-associated Neorickettsia sp. in Europe. Antonie Van Leeuwenhoek. 2018. https://doi.org/10.1007/s10482-018-1043-7.